Can we mix the sizes of the badges ? Of course. 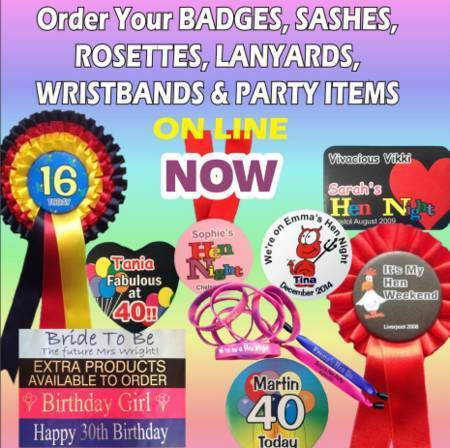 In fact one of the ways that we suggest for setting the hen, stag or birthday boy or girl apart from the rest is to have a larger size of badge for them. We aim to send out orders on the same day that they are received, provided they are placed before our cut-off time, which is approximately 3pm. The exact earliest delivery date for the UK is shown on our shop web pages. We normally send our orders by First Class post - but for a guaranteed next delivery you must select the Guaranteed service offered at check out. I'm in Ireland - how quickly can you get the order to me ? If you are in Northern Ireland then we can deliver next day provided you choose the guaranteed delivery service offered by Royal Mail. Orders to the ROI are normally sent by airmail which can take up to 10 days. We can offer much quicker deliveries, depending on when you place the order which would mean you could probably get the order within 48-72 hours. Can we have any colour ribbon on our rosettes ? You can choose any combination of our standard colours for your rosette layers - including the tails. A range of some of our ribbon colours are shown here. Do we need to edit the photograph if we want a photo badge? No. We will clean up any image suitable for the use on a photo badge. Are you available by phone if we need to discuss an order ? Yes - just call us for advice. We are also here most evenings and weekends. Can I design my badge on line ? You can select your design, add the text and see the effect of changing the rosette colours. Unfortunately at this time we do not have the facility for you to design your own - but we can email an example of any badge design and colour combination that you require. If you cannot see the design you want then just fill in our enquiry form and we will send you a quotation. This will not significantly slow down your order as we aim to respond within 12 hours and we quote and you agree and send payment then our normal delivery times will apply. I see the type of design I like - but I want to change it - is that possible? Of course. If it is just the wording or a simple colour change then you can probably just order on line and then put your comments in the 'additional comments' box. If it is more involved then it would be better to either phone us or email us and talk us through it. In general though, it won't be a problem. Can you add a photograph to our sash order ? We cannot add a photograph but we can convert it to a basic line drawing, which can be added to a sash. Is there a limit to the text we can add to a sash or badge ? No , and we do not charge by the letter- but there is limited space. The more text - the smaller it will be. The price is the same no matter what text you have. Can you add a logo to our sash order ? Provided you have the authority to use the logo , then just send it with your order - but note we can only print sashes in single colours. Do you offer a discount for larger orders ? The price per items is automatically programmed to reduce as the quantity increases. Do you offer a quicker delivery option for non-UK destinations ? Yes. Our normal delivery method would be AirMail. We do however have good rates with couriers such as Fedex, UPS and DPD which means we can offer very quick deliveries to The Republic of Ireland, USA, Canada, Aistralia, New Zealand and mainland Europe. Do you have any videos we could watch to help us make up our mind ? We have several videos that explain the options and give advice on how to order. These can be viewd on our video help page.